Ready to unleash your unpredictable side? 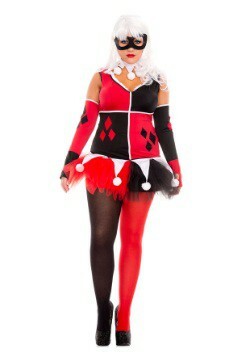 Then it might be time to wear one of our Harley Quinn costumes! 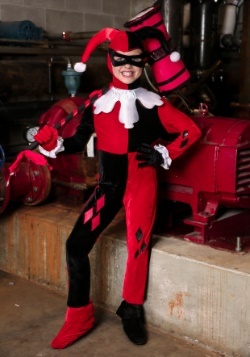 They’re based on the iconic Batman character and come in a variety of styles for both women and girls. We also have a large assortment of themed accessories, which you can use craft the perfect look for your foray into villainy! 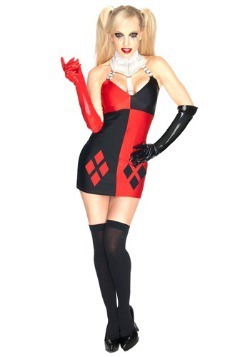 Harley Quinn, also known as Dr. Harleen Frances Quinzel in the Batman franchise, is one of Batmans most notorious female villains. First appearing on September 11, 1992 in the episode, "Jokers Favor" in the TV series, "Batman: The Animated Series", Harley Quinn was ranked #45 in IGN's 2009 Top 100 Comic Book Villains of All Time. 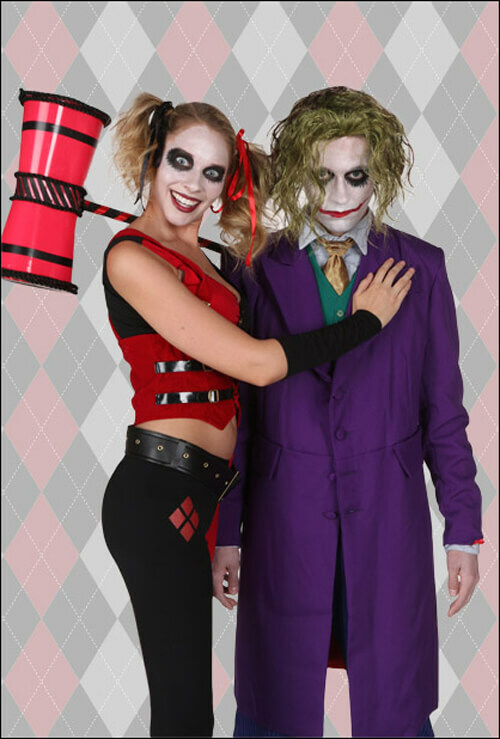 Throughout the Batman franchise Harley Quinn displays a great, love-hate relationship with the famed villain, The Joker. 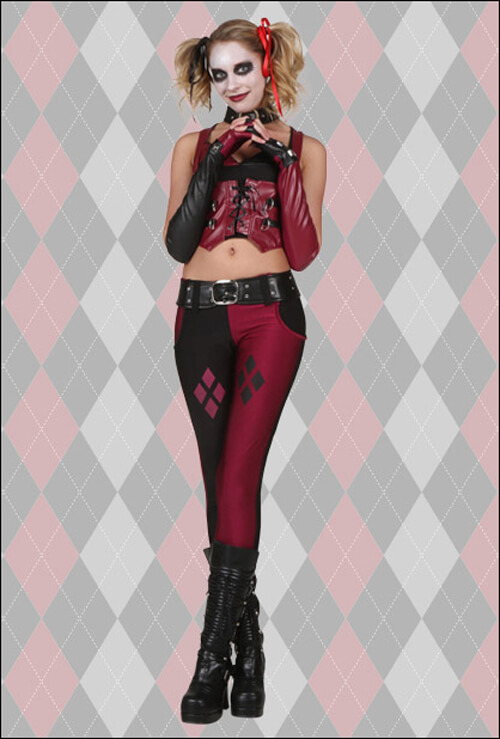 Known for her black, red and white suit, you can now get the famed villains look with our awesome selection so you can become any version of the character you want with any Harley Quinn costume that we carrry. Each comes from movies, television, comics, or video games so no matter which you prefer we have a little something for you. The character remains so popular that we continue to get new designs all the time, from many different mediums from video games to graphic novels. 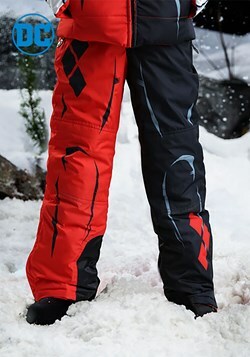 So, check them out often and become the Gotham baddie with ease! 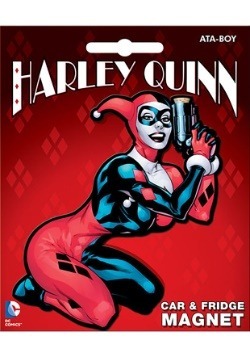 While the original, animated Harley Quinn wore a one-piece catsuit, 2011's "The New 52" version of Harley Quinn was more provocative. Her costume was still form fitting, but now more revealing and significantly more edgy. 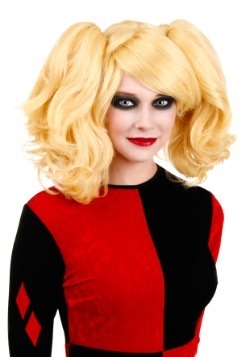 She traded in her harlequin hat for red and black pigtails and bleached skin (rumored to have been caused by Joker kicking her into a vat of acid). 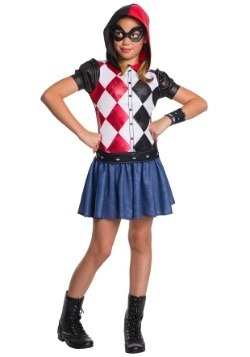 Did you know that this Harley Quinn also happens to be a roller derby queen? It's true! Feel free to switch out the rugged boots for a pair of skates. 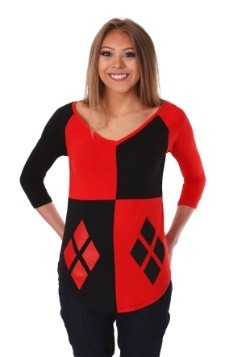 Harley's look is only restricted by one thing: Whatever she wears, it must be in her signature red and black color scheme. 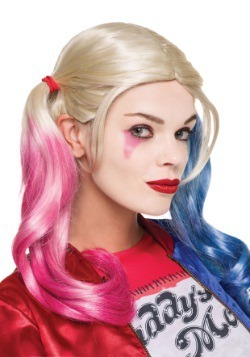 (This is comic book law – Hollywood took Harley Quinn's standby to new places in The Suicide Squad franchise). 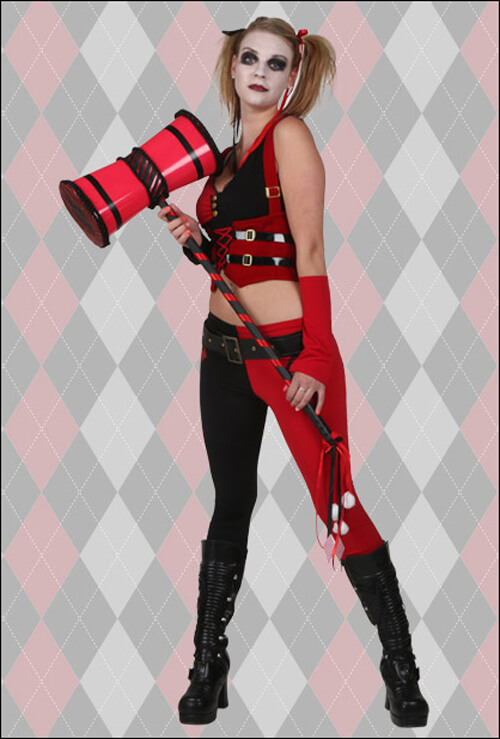 This playful disguise features brighter reds and an oversized mallet. 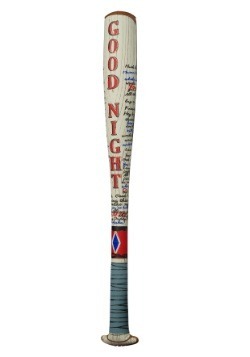 Who says she can only use a bat to beat "the Batman?" 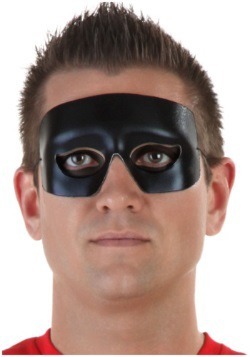 Not only is this getup comfortable, but also it's easy to DIY if you’re an antihero on a budget. Pick up a few accessories and combine them with what you already have. Date night with the Joker hardly seems like a girly proposition, but he happens to be Harley's one and only (the dysfunction is strong with this couple). 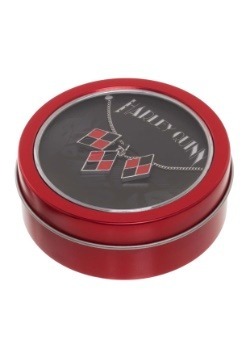 Harley's dressed-up look features a micro minidress (in red and black, of course) with a show-stopping choker collar inspired by straight jackets and garter belts. 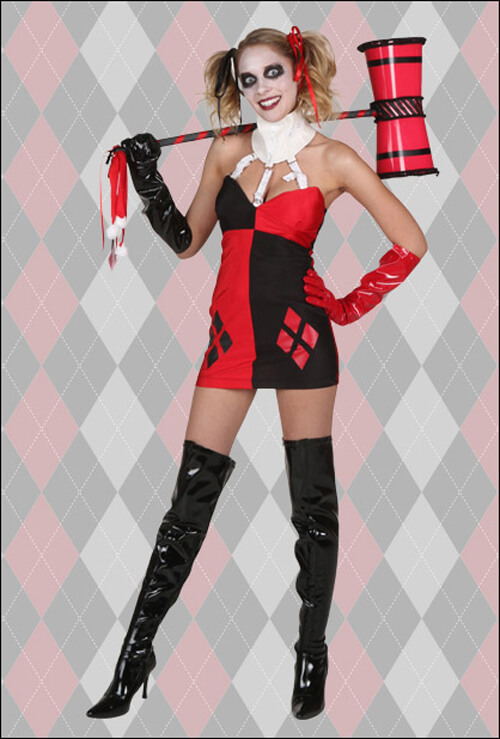 Thigh high boots and an oversized mallet make it complete, just add Joker, and voila! You are two crazy clowns on the town. When a girl's on a maniacal mission, she'll sometimes switch up her personality to seduce with sweetness (and throw "Mistah Jay" off his grisly game). 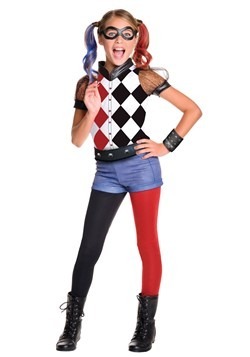 There is glorious madness in the underpinnings, finishes and trims of Harley Quinn's intricate Showgirl ensemble – her smeared makeup somehow blends perfectly with the glamour of sequins. Maybe it's the glare getting in your eyes, but you almost forget that it doesn't take much convincing for her to turn a bazooka on people. 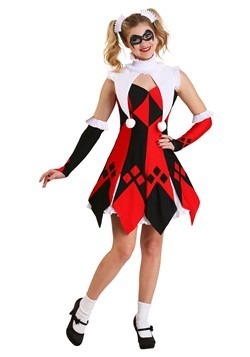 Harley Quinn isn't often the belle of the ball, but this whimsical tutu dress offers just the right pinch of pouf to ensure her dance card is full (sorry, Joker). 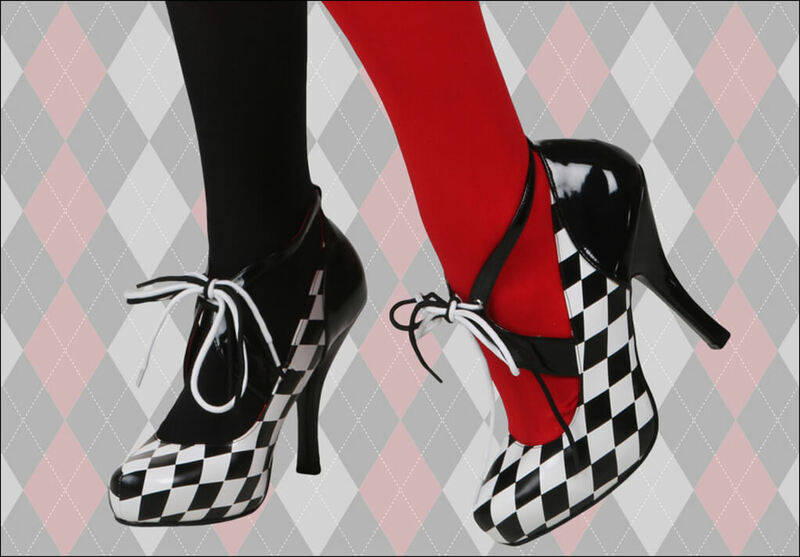 We feminized the look even further with a pair of red and black stockings and super sweet, platform mary janes. Calling all IRL black swans: You could get a similar look by pulling together accessories you already have and adding our Harley Quinn corset to tie everything together. 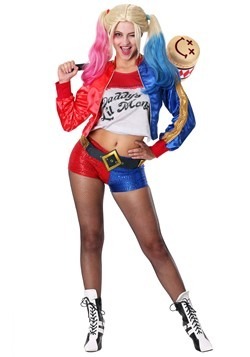 Harley Quinn's character was created almost at the behest of Joker, with a lot of motivation for exuding psychotic behavior stemming from her endless attempts at winning Mr. J's approval. 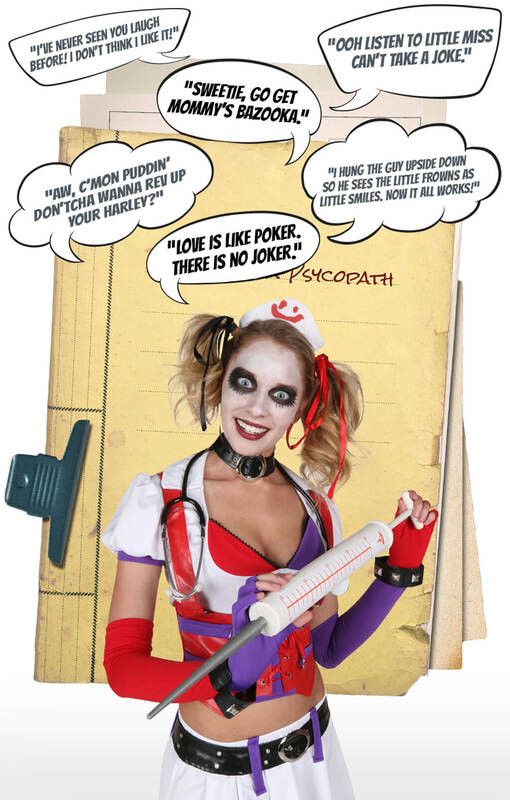 Even after stepping down from her psychologist role, the reincarnated Harley Quinn picked up a part-time gig as a nurse at Arkham Asylum so that she could help her beloved escape confinement. PATIENT WARNING: Harley Quinn doesn't do bedside manners. 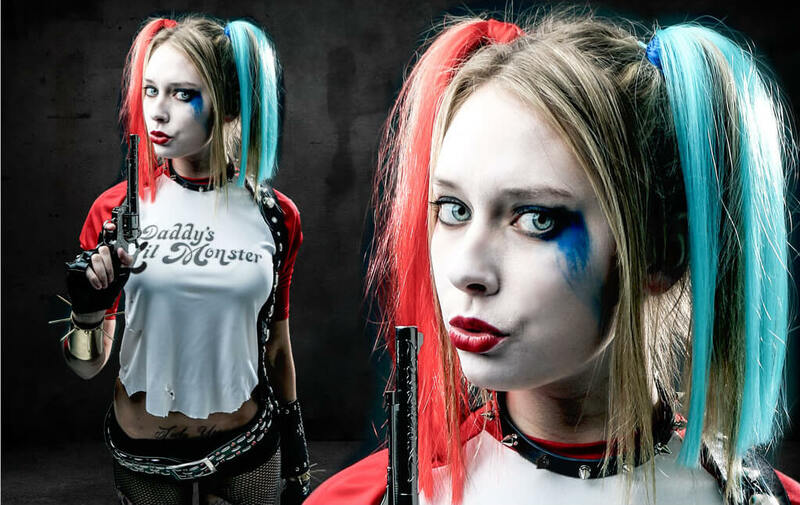 Harley Quinn may have started off in the supporting cast, but she now is a title comic book character with a series that's at the top of the bestseller charts each month. 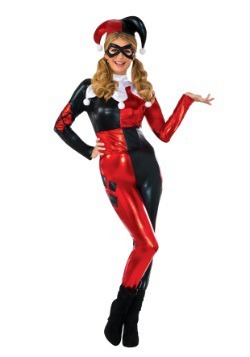 Therefore, when you choose to become Harley Quinn for an event like ComicCon, or even Halloween, you can be sure that this popular, much-loved character is going to get a lot of attention. Prepare to say "CHEESE!" with one of these Quinn-tessential poses. 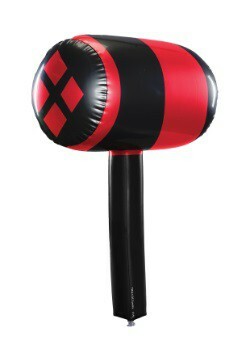 When she absolutely, positively has to create mayhem, any blunt object will do… but the oversized mallet is Harley's go-to—it's like a Visa card, she never leaves home without it. Regardless of the comic effect, Harley's hammer goes into battle with the serious intent to leave her victims bruised and battered. Pro-tip: If you'd prefer less police attention this Halloween, just strike a pose and not a person. In the DC Comic space, Harley would often put a cork in her gun and shoot at enemies because her character's got depth; why kill 'em when scaring 'em is so much more fun? That's the nice thing about Harley Quinn: First she'll make you laugh, and then she just might make you cry. We love this gun because it's oversized and features a "BANG!" flag – a nod to her graphic novel beginnings. 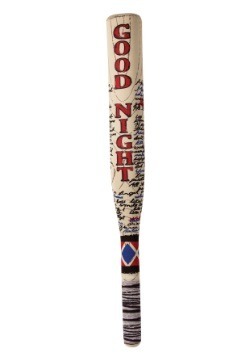 The bat Harley uses in Suicide Squad features many words and phrases, but did you know that it contains an inscription with the words to the lullaby, "Hush Little Baby?" 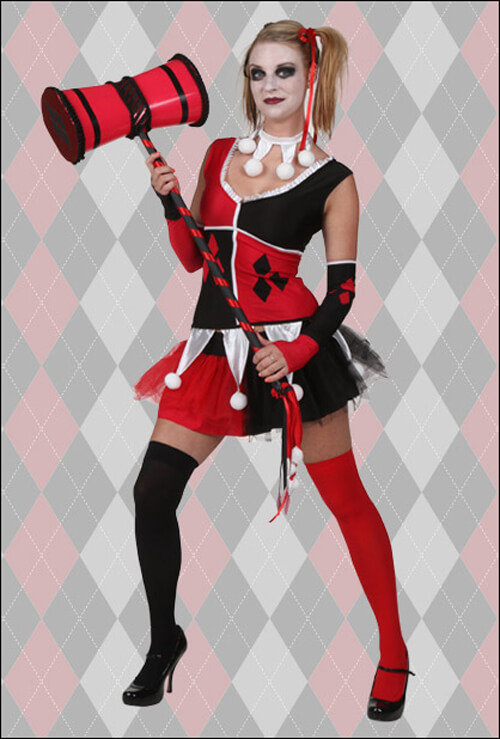 Whether you've chosen Ms. Quinn's bat or mallet, this is the pose du jour for her character in non-threatening situations. Sure, she's a little unstable, but weapons keep her balanced. If you want a great group shot, you'll have to be quick. She'll be back to wielding this hammer before you know it! She's not all bullets and brawling (even if that's the way Joker likes her best)! This is Harley's attempt at a come-hither stare. The Joker is not an easy clown to love, but she's always hitting him with her best shot. How else is a girl supposed to lure him away from evil doings or laboring over plots to put an end to Batman? 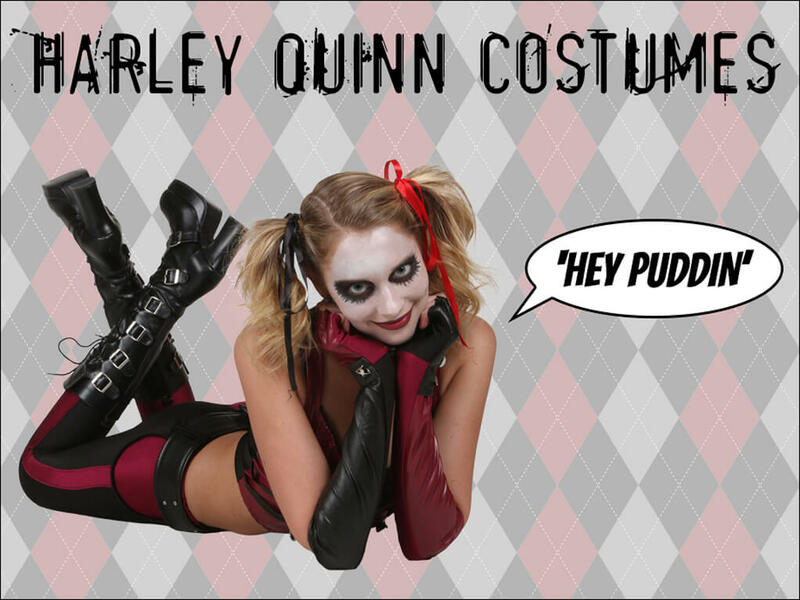 Of course we'd serve this sweet air kiss with a flirtatious, "Hiya, Puddin’!" Some may argue that Mr. J is the only pairing that's perfect for Harley Quinn. And really, he IS her greatest love. 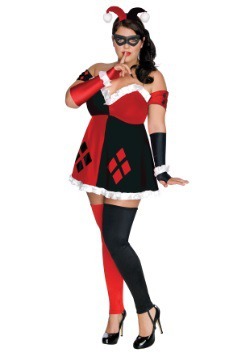 But there are plenty of bad guys in Gotham to show her a good time (watch out for Deadshot)! Or, hey, maybe she's had enough of the bad guys and will decide to give Batman a whirl... *gasp!!! * When your puddin' just doesn't treat you right, isn't it a woman's prerogative to keep her options open? We think so! He brings out the worst in her, and she brings out the best in him... The reigning Clown Prince and Princess of Crime were crazy in love before Beyoncé made it a song. 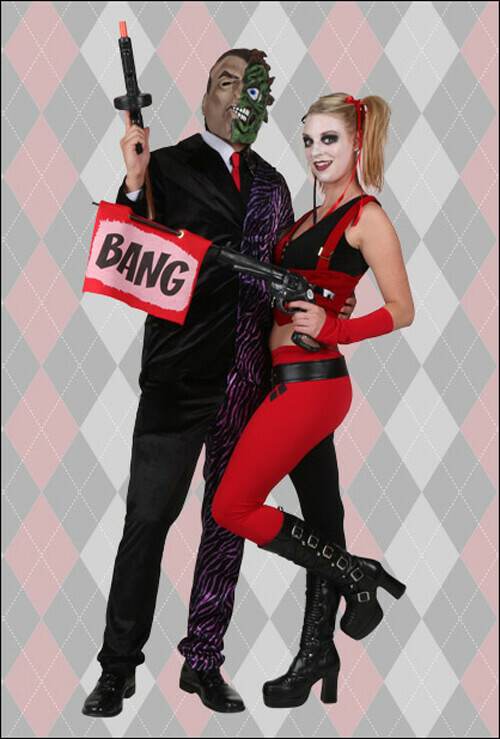 Like Bonnie and Clyde or Sid and Nancy, Harley Quinn and Joker's love defies logic. He's abusive and manipulative. She's loyal and co-dependent. It seems like it should never work, but when these two get together, things get psychotically silly in spades! It's hard for you to resist a man in a suit, but the pointy nose could be a deterrent. Admittedly, Penguin's got a look only a mother (or a gal with avian interests) could love. Still, his connections in Gotham are second to none, so he gets his oddly shaped hands on the cool toys before anyone else... even Joker. 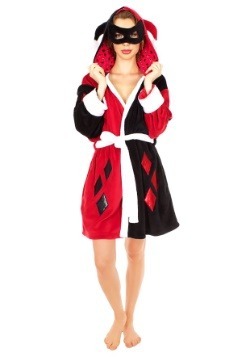 Who cares if romance never takes flight, it could be refreshing to step out from behind Mr. J's shadow for a few nights. There's nothing more attractive than a man with a plan. Sure, the Joker creates havoc wherever he roams, but there's nothing calculating about his brand of mischief. Erratic and ill-conceived, most of his actions are about gaining pleasure through others' displeasure. The Riddler, on the other hand, can fully explain, in excruciating detail, his next ten moves. When a girl needs flawless execution, Ed Nigma is the guy to call. 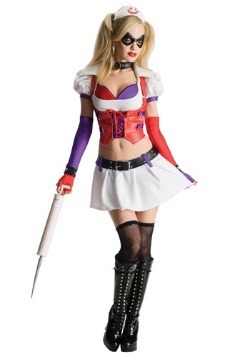 Harley Quinn typically likes her guys bad to the bone, but maybe that's because she never experienced what it could be like with a nice guy... Harvey Dent, once an upstanding district attorney in Gotham (he was scarred with acid – so they also share that in common), now teeters on the edge between good and evil. 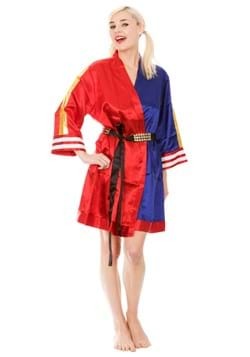 Two-Face offers ladies the best of both worlds, and proves that one girl's "bi-polar" is another girl's "just right." It's a small fry's nature to walk on a more villainous side. Superheroes save the day, but "the bad guys" get to destroy it (and that's WAY more fun)! For example, if you were given the option to clean up the Legos, or to throw them all over the room, which role would you rather play? Exactly! You're a Lego-thrower and you've passed that gene down to your mini-mes. 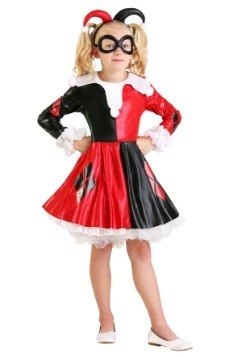 Embrace their precociousness (AND the adorableness of this pint-sized Harley Quinn tutu dress)! 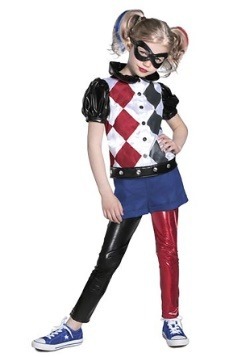 We offer the most villainous Harley Quinn costumes for kids for all their dressing up needs. Never underestimate the power of a brother and sister with a sense of humor. When Harley Quinn and The Joker are in cahoots, there's no telling what kind of trouble they'll get into... robbing banks, stealing cars or even holding a cousin hostage! There's only one way Mom and Dad can stop them (after they've taken a snapshot of the cuteness, naturally), and that's to call Batman. Gotham's Dark Knight is this duo's only true weakness. 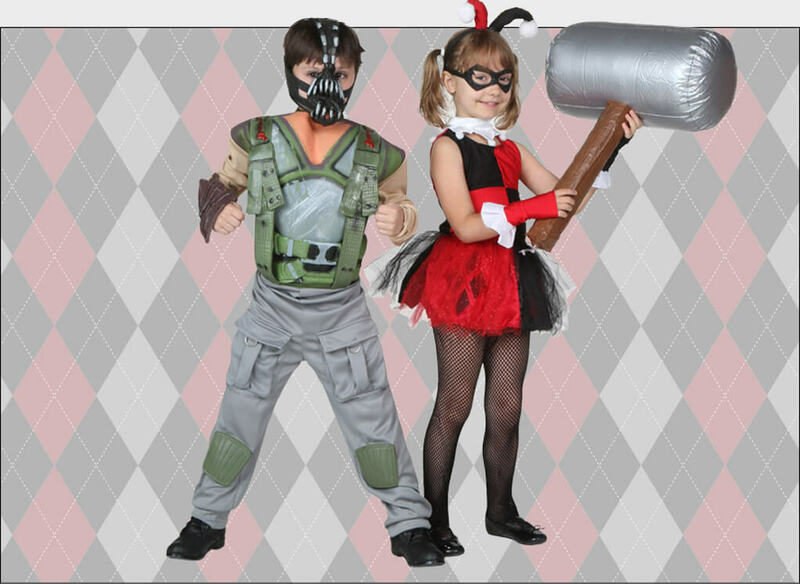 Bane and Harley are putting Gotham on notice! Teamwork makes the dream work when these two conjure up a scheme. They don't seem like a likely pair, but they have one very important thing in common: Both of them hate Batman. 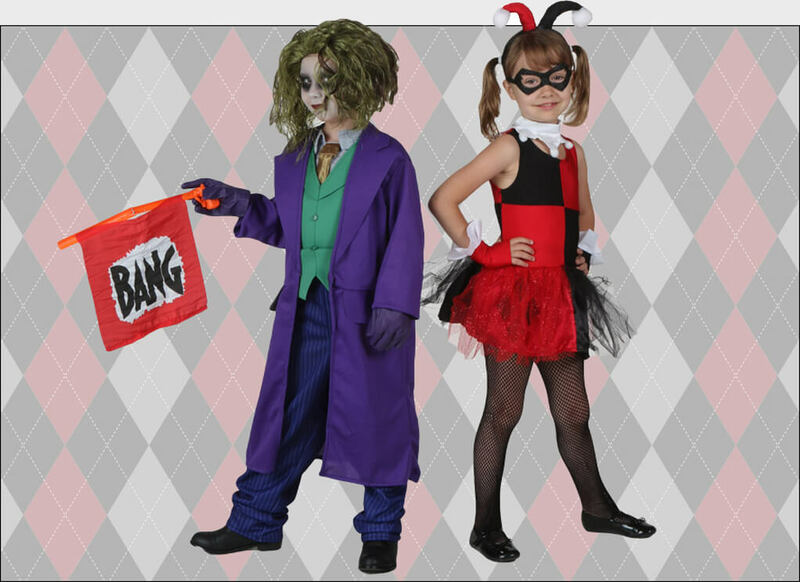 Devising tricks and traps are all in a day's work for the crazy kids who love to antagonize The Dark Knight, and it makes us pretty sure that a life of crime never looked so precious! 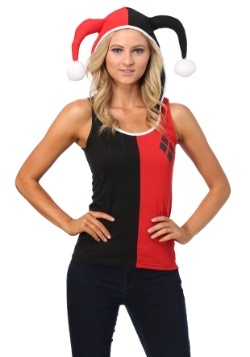 Some girls dress to thrill, but Harley Quinn dresses to kill. 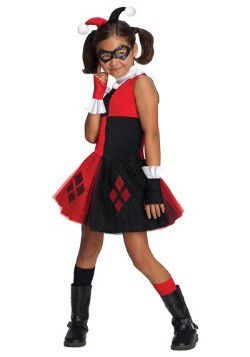 Unlike many of her pals (such as Poison Ivy or Catwoman), she's always up for a costume change. 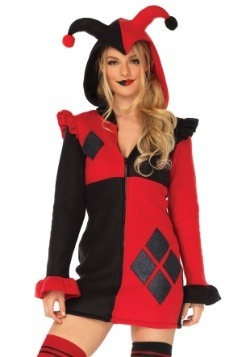 From her one-piece classic jumpsuit to a two-piece nurse disguise, you never know which Harley is going to show up at your door to get the party started. 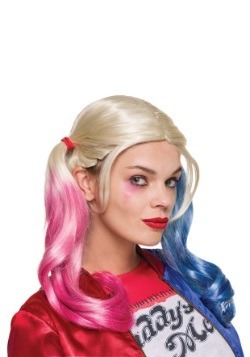 It also could be the secret to her allure: Maybe there's a little Harley Quinn in all of us. 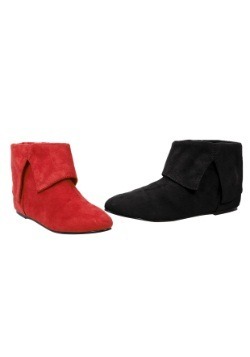 Add a few special touches and make her look your own. "You think you're scary? Well, mister, I've seen scary, and you don't have his smile." 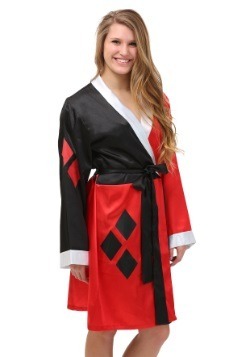 For every insane, murderous deed you (and your Mr. J) ever commit, there's still a part of your personality that's completely "Harley from the Block." 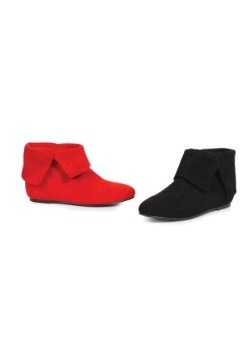 You're silly, albeit a little scary, and ruffles let your sweetness shine. Pull on a pair of cuffs that tell the world you've made some mistakes, sure, but you're a work in progress. Harley is Joker's biggest fangirl, and yet he lives for every opportunity to push her away. 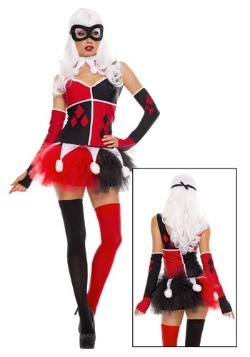 You put on a good poker face, Mr. J, but underneath it all, we believe you're smitten. As the unrequited one in this scenario, you may not be as convinced. 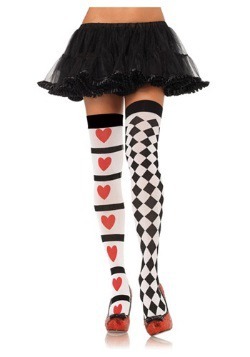 But just for giggles, slip on a pair of these mismatched (exactly the way Harley likes them) stockings with your Harley Quinn minidress and see if you have the power to stop him in his tracks. We thought as much. 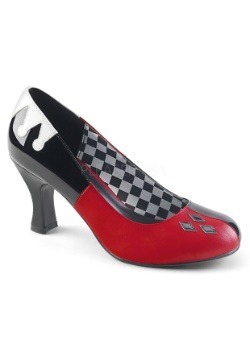 Keep Joker in check because these shoes were made for walking, and that's just what they'll do if he doesn't get his act together! 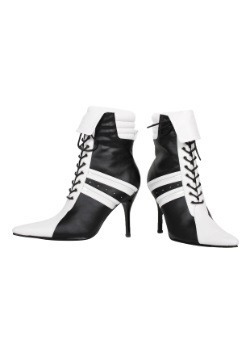 A pair of pumped up kicks can make any girl feel like a million bucks, and these heels are no exception. 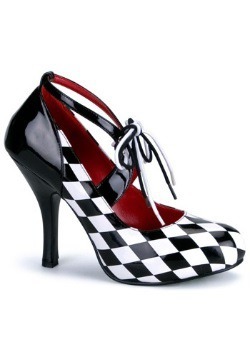 Patent leather mixes with a bold checker pattern and makes you want to get tangled up in some mischief. What are you waiting for? Get out there and make a few bad decisions! Arkham Asylum may have defined her as a "psychopath," but what if Harley Quinn is merely a woman who is madly in love with a man who won't give her his heart? That's enough to drive anyone insane! On the upside, it does provoke her to say some of the darndest things. If you don't have a moment to watch a couple episodes of the animated series, no problem! Memorize a few of her most iconic lines and leave your audience in stitches. 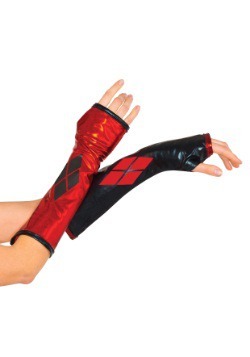 DC Comics' blockbuster, Suicide Squad, has reimagined the Harley Quinn character as being bolder than ever before! She still has an innate likeability (thanks, in part, to Margot Robbie), but her style has completely changed. (Hello, sequins!) Our in-house makeup team has created step-by-step instruction on how to create an intense eye, bright lip and dip-dyed pigtails - they'll even show you how to make Harley's arm tattoo! 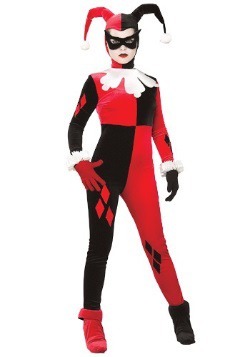 Harley's Suicide Squad costume is deceptively simple, with tons of details and small little nods to her playful yet menacing nature. Below is an image that captures her crazy cool look from the film. Use them for inspiration and reference! 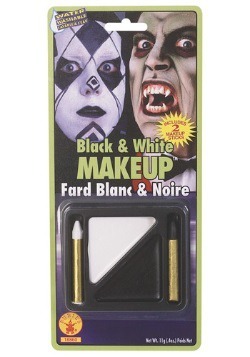 If you follow our handy DIY guide found here you too can become the pig-tailed menace this Halloween.